The “Bergdoktor” and the Wilder Kaiser simply belong together. The TV-series about the alpine doctor has been filmed in the region since 2008 and Ellmau and Going are officially called the “Bergdoktor villages”. The mountain doctor season opens with the mountain doctor week for families. Immerse yourself in the TV series by enjoying a program based around the mountain doctor. We also arranged a special program of other activities for the whole family to enjoy. The region Wilder Kaiser invites you to the ‘mountain sport week’ from the 21st to 28th June 2015. We offer a variety of mountain sports for you to try or enjoy with local professionals. All activities are free of charge. 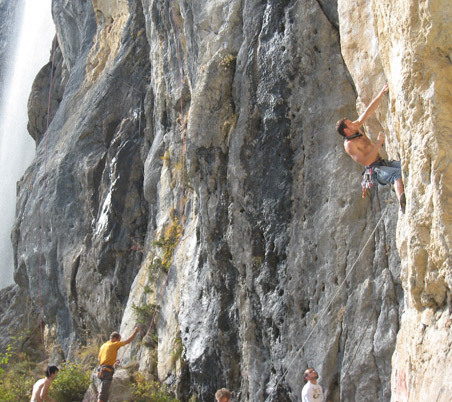 Under the instruction of qualified mountain, climbing and biking guides you can select a program that suits you. Choose from a variety of sporting activities, from sport climbing and mountain biking to river rafting and canyoning. The prelude to the mountain sport week (on the evening of the 21st of June 2015) is the spectacular annual ‘fire burning festival’ around the Wilder Kaiser! After a warm welcome in the Ellmauer Alm this special week provides a “vacation week in the film”. Immerse yourself in the TV series by enjoying a program of activities based around the mountain doctor. The highlight of which is the ‘fan day’ where you will have the chance to meet Hans Sigl and the stars of the mountain doctor TV series in person. Mit den Stars: Hansi Hintersee, Semino Rossi, die Amigos, Marc Pircher, Belsy und Florian, Sigrid und Marina, Oesch’s die Dritten und die Zillertaler.